For printing posters, POP displays and large prints, the HP DesignJet Z5200ps will bring outstanding, professional results. The price represents a significant investment for small businesses, but it will increase the efficiency of busy workplaces, as it handles large tasks without slowing down the systems. It will particularly suit an architectural or design environment. However, if space is at a premium, consider where the printer can be placed so that noise disruption is at a minimum, and whether it will be necessary to purchase a separate scanner and copier as these are not included in this printer. 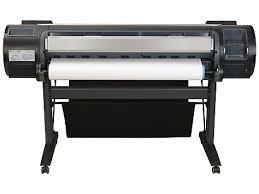 At 177cm x 69cm x 104.7cm and weighing 86kg, the HP Z5200ps is a large, professional printer. It utilises thermal inkjet technology, and with eight cartridges (cyan, magenta, yellow, light cyan, light magenta, light grey, matte black, photo black), the print quality is outstanding. It connects to the workplace system using Ethernet and USB. It incorporates a generous hard disk and a built in Postscript interpreter, allowing it to handle large tasks without slowing down the workplace systems. The HP DesignJet Z5200ps will increase workplace efficiency. The printing rate saves five minutes per print. Printing jobs can be managed effectively as files can be submitted at the same time using the Postscript. With a 160GB hard disk, the printing job is unlikely to cause any disruption to the operating systems. The thermal ink jet with eight colour cartridges gives excellent results with a print resolution of 2400 x 1200 optimised dpi, and there will be a reminder when ink supplies are running low. Energy consumption is unusually low. The HP DesignJet Z5200ps is a costly model but has no capacity for scanning or faxing. The size and weight of the printer make it awkward to move, and the shape is inconvenient as the spool at the rear of the printer will not go against a wall. When in operation, the noise levels are high.